I was invited to take part in Titan Travel’s June supper club. The recipe for the month was Basel Tart, a cheese and onion tart originating in Basel, one of the many destinations that Titan Travel go to. Basel is on the banks of the Rhine in North West Switzerland. I’ve not been to Basel but it looks lovely, with lovely river scenes and many museums and theatres. Basel tart is a big, satisfying tart. Its made with onions and bacon that are caramelised before adding Gruyère cheese. I thought that I didn’t like Gruyère but actually I really enjoyed this! Rosemary and coriander are the herbal additions to Basel tart, not herbs that I would usually put together but they flavour this tart perfectly. This is a great tart for a crowd or maybe for a picnic. I had a lot of left over pastry from this recipe, handy for another time! I used less cheese than suggested as the supermarket I used sold Gruyère in 200 gram packs and strangely only had 2 left the day I shopped! I needed to cook my tart for a further 40 minutes than the suggested cooking time. This entry was posted on July 8, 2013, 10:20 and is filed under Baking. You can follow any responses to this entry through RSS 2.0. You can leave a response, or trackback from your own site. This reminds me of a quiche…Looks rich and tempting! It’s just like quiche Liz! Ah, but it must be the bacon that is tying everything together, Jayne 🙂 Looks tasty and rich and amazing. Thanks for sharing. Will you return to the supper club? Sounds like great fun! Yes the bacon does add that special something! The supper club is a great idea, lets see if Im invited back! 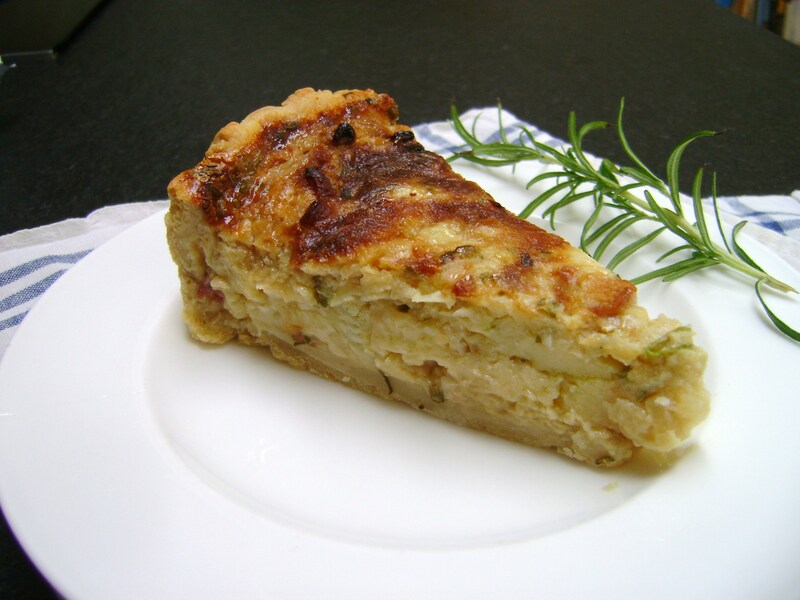 Yes, this reminds me of a lovely French quiche too with bacon instead of ham, love the flavors of rosemary and coriander too….Your photo looks so tempting and yummy! Thanks Wendy, you are too kind – the photo was a very rushed effort Im afraid! We finally have summer here too, hoping its a long term event this year! In Basel’s Swiss German this tart is called Ziibelewaie (pronounced Tzeebalawihee) and we eat it most during carnival in February! It’s best served with a salad and in winter with a Mählsuppe (a flour soup, which for Non-Baslers might taste a bit strange) Cheers from Basel! Thanks so much for your informative comment! Salad is the perfect thing to enjoy it with!